The humble garden rake is the first point of call when there's an unholy mess in the garden to clean up. There are numerous types of garden rakes, that have a specific use such as the leaf rake which is great for that fall clean-up, the scarifying rake and the flower rake. The contempory rake has steel, plastic, rubber or bamboo teeth or tines, although traditionally they have been made with wood or iron, whilst the handle is typically made of wood or metal. 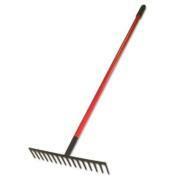 Rakes with 10 or 12 teeth are the most suitable for lightwork such as seed bed preparation and to level the soil. Rakes with alloy handles are light in weight and easier to use but tend to be more costly than those with wooden handles. Although it may appear that all rakes are the same, nothing could be further from the truth. Choosing the wrong rake could in fact cause damage to your lawn, clog up unnecessarily and fail under heavy work, all the while making it more difficult for you in the cleaning up process. The scarifying rake is a great gardening hand tool that every gardener should have in their inventory , as is great for getting rid of that stubborn lawn thatch, seeding and cutting grass roots to stimulate growth. The Wolf URM3 model shown here has a smooth pendulum motion with special hardened blades. No resharpening of blades is required and the easy roll wheels make for a consistent height. This pulls out the rhizomous weeds and leaves the grass mostly intact. Medium wet earth works best, and parched dry earth works the worst. The wheels help in a number of ways to make it easier on legs and back. 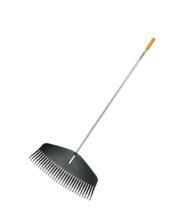 The leaf rake has a fan shaped head with many springy plastic or wire prongs. These are used for collecting up loose leaves and light debris from the lawn. The design and style of the rake means that you can use it at significantly more angles which means you don't need to throw the rake in front of you and draw it diagonally against the lawn like classic curved v-shaped rakes tend to do. The smart and practical design of this garden rake is likely to make your fall clean-up tasks quicker and easier. The 24" head grabs more leaves than most other rakes without clogging, and an innovative ergonomic design assures comfortable use. This is a convienient small hand rake with metal or rubber splines and is used for raking and loosening soil around delicate flowers and plants, and breaking up small dirt clumps.